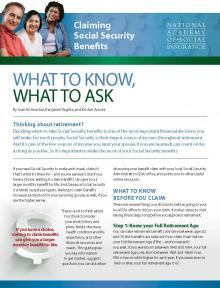 Deciding when to take Social Security benefits is one of the most important financial decisions you will make. For most people, Social Security is their largest source of income throughout retirement. And it’s one of the few sources of income you (and your spouse, if you are married) can count on for as long as you live. So it’s important to make the most of your Social Security benefits. There’s a lot to think about. What to Know, What to Ask is designed to get you started. This guide provides key information, suggests questions you can ask your local Social Security Administration (SSA) office when discussing your benefit claim, and points you to other useful online resources. It was developed in conjunction with Different People, Different Choices, as part of the Academy’s toolkit, When to Take Social Security: It Pays to Wait.